Some of you probably already know CodeTwo Public Folders for its Outlook synchronization abilities. And that’s all good. This program is indeed a powerful collaboration platform for Microsoft Outlook users that lets them easily synchronize Outlook calendars, contacts, tasks, notes, mail and even documents between each other. All this can be done without any expensive servers, high-level technical expertise and large sums of money. Just a few days ago we launched a major update to the program featuring some important novelties like e.g. an Internet synchronization service. Apart from that, CodeTwo Public Folders is now also equipped with another handy component which we would like to present to you today, the built-in File Sharing App. 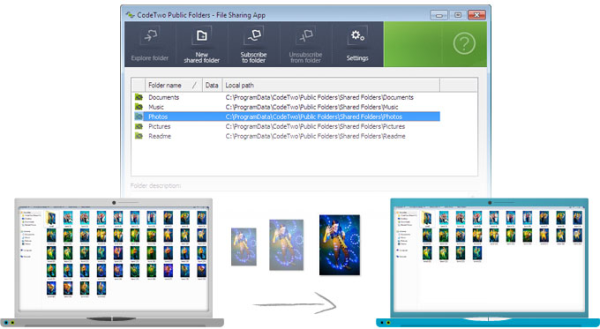 After installing CodeTwo Public Folders Client Apps and connecting it to your Syncing Master (Watch a video about the installation…) you will find the program in the Windows Start Menu: All programs > CodeTwo > Public Folders Client Apps > File Sharing App. Provided you have followed all the installation guidelines, you don’t have to do any additional configuration to make it work. The creation of a new shared folder is pretty simple. Click on the New shared folder icon in the app’s top menu and give a name for the new shared item. 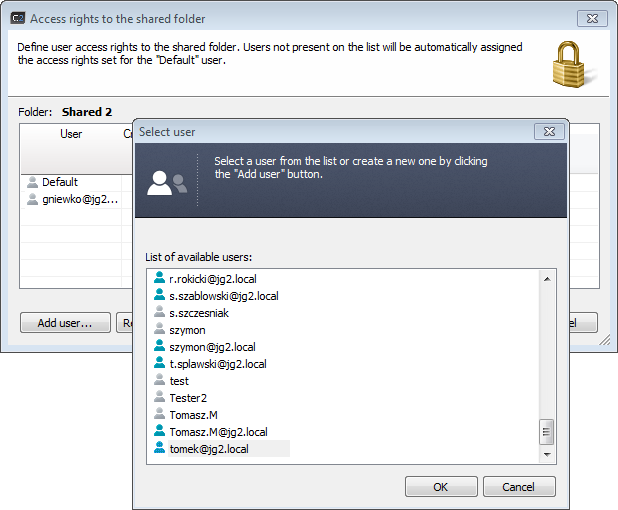 In the resulting window you will be asked to give the access rights for the newly created folder. You can edit the default permissions for it, or give specific access rights for particular users. It’s up to you. After you confirm that window, the shared folder will be created and every element stored in it will be shared with other users in real time. To access it from another machine, your team mates only need to subscribe to it, by clicking on the Subscribe to folder icon in their File Sharing Apps and choosing the right item from the list. From now on every file you drop into the shared folder will be immediately synchronized with your subscribers’ machines. If you feel like this is the right solution for you and your office, feel free to test in your environment. The installer is provided in the CodeTwo Public Folders package. 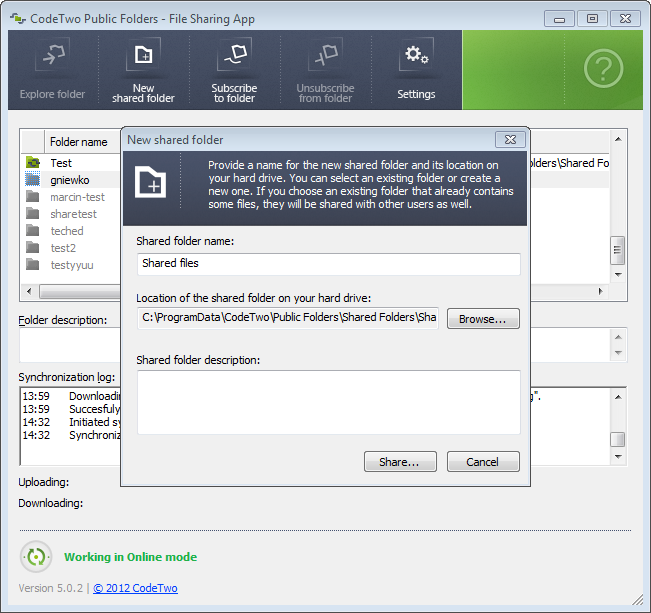 After the installation you will be able to benefit from the numerous advantages CodeTwo Public Folders gives to you. Because it’s cost-effective and extremely easy to deploy. You don’t need to invest a lot of money in an expensive server infrastructure and maintenance. Because it simply works and, unlike other solutions, puts no restraints on users – there’s no storage limits or file type limitations. Because this program uses absolutely no Cloud accounts and intermediary servers to send your precious data across the web. Your files are always safe and only you and your workmates can see them. The only place, where your shared files are stored are the hard drives of your computers. 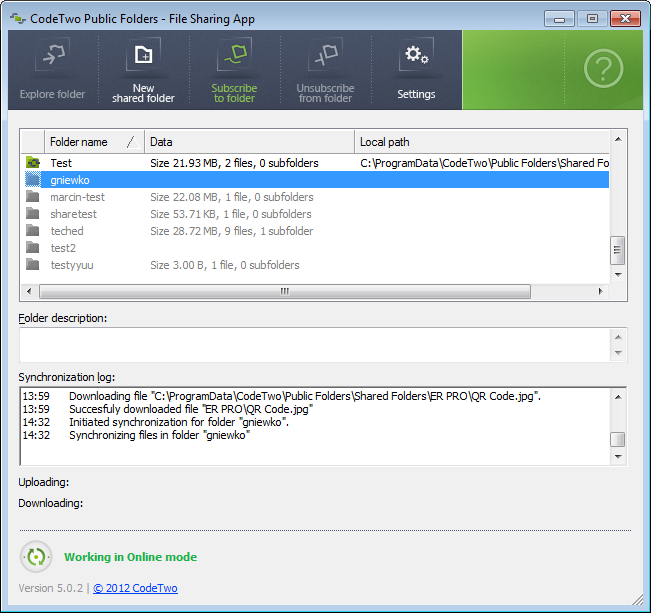 CodeTwo Public Folders can be tested for free for 30 days. For any questions or assistance, feel free to post your questions under this article or contact CodeTwo Customer Service.